I’m still very new to posting to a blog. I’m going to start with why I think I do this work, why I love education advocacy work. I grew up poor; my mom was a single mom of 4 kids who worked for the telephone company. She valued education and encouraged us to succeed. In spite of this, I lost a brother to drugs and another brother for 20 years to alcohol (sober 15 years now). We lived in a working class neighborhood where most people worked at the Armour meat packing plant. I went to high school knowing I would go to college. I took college prep classes and I had pretty good grades, good enough to get into a state college. I vividly remember talking to my school counselor about going to college. I remember she was cute, blond, perky and that I only met with her once in the course of four years. The reason I remember her is because she discouraged me from going to a four year college. I never understood why. I can only guess it was because I was poor and my mom was a single parent, and my brothers were in trouble a lot. She wouldn’t help me get the applications for college; she wouldn’t help me figure out how to apply to college. I had no clue. No-one, literally no-one I knew had gone to college. Through sheer will I figured out how to get an application and I got in, went to college, worked at Microsoft, had children and became an advocate for education. I do this work because it shouldn’t be so difficult for children, who want to learn, to get a good education. I want higher graduation requirements because I know most students need the guidance and the push to get what they really need. If we don’t have the structure, too many children are discouraged, like me, from trying. And, if they didn’t have the parental support, or didn’t have the intense drive, they would just stop trying and never get the education they deserve. On Wednesday, I saw parents from all across the state come to Olympia to say “our kids need more.” They need a six hour class day in order to just keep pace with 21st century demands, they need quality teachers to make sure that they learn a years worth of material in every year, and they need higher graduation requirements to prepare our kids for a 21st century life. HB 1410 and SB 5444 resonate with parents and the community. The world has changed. Our children need more time in the classroom and more higher level classes, and they need quality teachers to deliver them. These bills deliver a 21st century education our communities want and our children need. 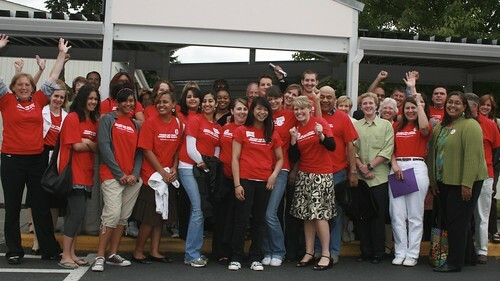 I spent last Friday with the 2008-09 City Year Seattle/King County corps, and it was wonderful to be back! This time last year I was wearing the red jacket, volunteering at Chief Sealth High School and running a service-learning program for high school youth. Last Friday I put on my alumna hat by speaking with City Year stakeholders and educating this year’s corps about why they should vote. What a powerful group of young people — 53 idealists from across the nation, ages 17-24, who have come to Seattle to serve youth in the Pacific Northwest. 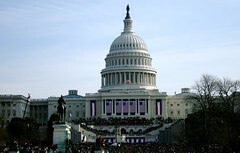 A few corps members are from Washington; most are from out-of-state. Yes, that’s right — here’s a fresh crop of new Washington voters, young adults eager to learn about Washington’s public schools. These are our most valuable education voters. They are our future teachers, school administrators, non-profit leaders, social workers and perhaps even our future legislators. 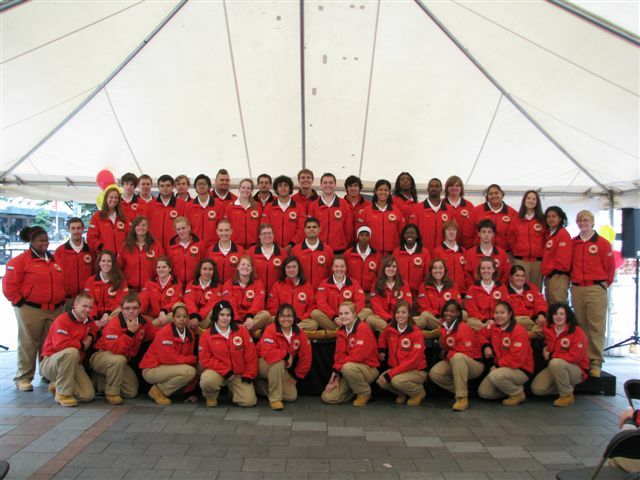 City Year places these energetic, passionate young adults in schools around Puget Sound, including Wing Luke Elementary, Dearborn Park Elementary, Denny Middle School, Asa Mercer Middle School, Chinook Middle School (Highline), Chief Sealth High School and the African-American Academy. Corps members also serve youth at Treehouse, South Park Community Center and the Center for Young Adults (part of the YMCA of Greater Seattle), . City Year corps members are familiar with education issues because they are in classrooms as tutors and mentors, providing academic support to K-12 students and facilitating afterschool programs and weekend service-learning programs. They are invested in the issues because they know the students, parents and teachers affected by key issues like the WASL, graduation requirements and funding. Last Friday was productive and inspirational. It started with the Breakfast of Champions, a community engagement event attended by a variety of stakeholders including Cheryl Chow (president) and Harium Martin-Morris (director) of the Seattle School Board and Davy Muth, Wing Luke Elementary principal and City Year service partner. Following the breakfast, I delivered a presentation to the corps called, “You, Washington State and the 2008 Election.” My goals were to register new voters, remind out-of-state voters to check their state guidelines and to highlight why every vote counts. Here in Washington State, we’re all quite familiar with tight races. If the 2004 gubernatorial race and last year’s Simple Majority Campaign won’t convince you that your vote matters, I don’t know what will! According to a USA TODAY/MTV/Gallup Poll of registered 18-29 year-old voters (see the October 6th USA Today article, “Young voters hint at electorate shift”), Obama leads McCain 61 percent to 32 percent among this age group, making this “the most lopsided contest within an age group in any presidential election in modern times.” The young voter turnout rate jumped 9 percentage points from 2000 to 2004, and in the presidential primaries, it nearly doubled in 2008 (since 2000). Volunteerism is on the rise, especially among young people. 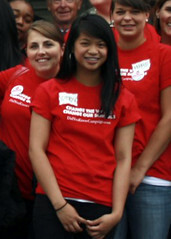 Involvement in community service raises social and political awareness. Greater knowledge and investment in pressing social issues fuel the fire for change. It’s no wonder young voters support Obama. He inspires greater participation in national service programs like City Year, Teach For America and AmeriCorps because a) he’s mobilizing youth and b) he’s willing to financially reward those who commit to national service. City Year, keep up the great work! Friday was a reminder of the importance of outreach and the ripple effect that it has on social change. The African American Achievement Gap Advisory Committee (created by HB 2722) met at UW-Tacoma yesterday. The main attraction of the meeting was Paul Ruiz of The Education Trust. Mr. Ruiz is one of EdTrust’s experts on the achievement gap, and brought along the latest version of “Education Watch: Washington.” You can read the 2006 version here. Kids should leave high school with ability to pursue options (college, trades, etc). When looking at NAEP and WASL scores, Washington is telling two different stories about proficiency (Of 4th graders, 77 percent passed the 2007 Reading WASL, compared to 37 percent scoring proficient or higher on NAEP). The faculty of low-income/high-minority schools should mirror the faculty at affluent schools (meaning our teacher workforce should be more equally distributed). We shouldn’t force teachers to teach where they don’t want to go, but the Legislature can set money aside to be used by high-poverty schools as incentives to attract teachers. In order to improve student achievement, the Committee (and State) should set goals and then allow districts and schools to figure out to meet those goals. After a brief Q-and-A session with Mr. Ruiz, the Committee broke for a working lunch to discuss the efforts of its three workgroups. Next, we heard from Janell Newman (of OSPI) and Dan Barkley about district and school improvement and accountability. Dr. Newman and Mr. Barkley gave a presentation on Washington schools in improvement steps (as defined under No Child Left Behind) and how the State works with some of those schools. In the data recently released by OSPI, we learned 628 schools (of 2,115) are in an improvement step. This is up from 280 schools last year and 180 schools in 2005. And while OSPI only has the resources to help about 100 schools, they were able to make progress with those schools. The big challenge here is the State cannot intervene in schools in improvement steps unless it is asked. If all goes well with the State Board of Education, Washington will have a new accountability system that gives the State the ability to intervene when schools are struggling. To learn more about the effort of the SBE, click here. The Committee ended by reviewing its interim report, due next week. These are typically status reports, and the Committee seems on track to meet its final draft deadline in December. They say nothing makes sense in your twenties. You’re young. You don’t know what you want. But I do know what I want, and I can’t stop thinking about it. 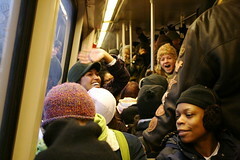 I want to teach Spanish in Seattle Public Schools, preferably at a high school in south Seattle beginning in fall 2010. I thought I “needed” to do “other things” first. For six years I was convinced that I would be a sportswriter. A few weeks into my first quarter at the School of Journalism and Communication at the University of Oregon, I woke up to the reality that writing about baseball everyday was not going to be as fulfilling as it was fun to dream about. The funny thing is that I have always wanted to teach, yet I always had an excuse as to why I should wait, why I should pursue other careers. Then again, maybe there were reasons that I was discouraged from teaching. It is pretty daunting to waltz into a broken system. Our failure to adequately fund our schools is aggravating. It is disheartening that we don’t invest more in our youth and our teachers. When you look at teacher salaries and school funding, it appears that we don’t put a high value on education. Why would I spend roughly $80,000 on Bachelors degrees (journalism and Spanish) and eagerly apply to graduate school for my Masters in Teaching (which means another $30,000 on top of outstanding student loans!) to go into a career where I work 10-12 hours a day, take my work home with me and start out earning less than $40,000 per year? Because there’s nothing else I would rather do. I have never felt so compelled to commit to anything in my whole life. Despite the pessimism and harsh realities of the education system, I can’t wait to have my own classroom. As a corps member with City Year Seattle/King County last year, I had the opportunity to tutor in a Seattle high school two days a week. Those two days a week clearly reminded me of a) why I’m up for the challenge and b) why I can’t wait any longer. Two years from now I will be standing in front of my own classroom. However, until then, I have my work cut out for me. I invite you to join me in this adventure. I’ll update you every Friday, and if something comes up during the week that I can’t wait to post, I’ll fill you in. Oh, and by the way, starting Tuesday of next week, I’ll be volunteering in high school Spanish classes once again… stay tuned! This is a special week. One million children will fill their backpacks with new books, nervous energy and optimism and board yellow buses to return to school. Some are all but guaranteed to end the school year far ahead of where they are now. Too many will be less fortunate, experiencing less opportunity for growth, or worse yet, stagnation. This school year we citizens have an opportunity to partner with educators, principals, and policymakers to ensure that all of our kids are headed back to school and back to quality. Our vision: Every student is able to read by third grade. Every child deserves to arrive on their first day of kindergarten prepared to succeed. Unfortunately, over the past five years pass rates on the 4th grade Reading WASL have declined. One of the most effective ways to get us back on track is to invest in high-quality early learning programs, like Washington Head Start, and professional development for child care providers. As the Basic Education Finance Task Force redefines basic education, early learning must be included as one of the most promising avenues to impact student achievement from the very beginning. Our vision: An excellent teacher in every classroom. Every child deserves a quality education from kindergarten and beyond, and excellent teachers are profoundly important to this journey. But three in five students in Washington attend an underperforming school where they may not learn what they need. That’s unacceptable. Fortunately solutions are in the works. The Basic Education Finance Task Force will propose measures to professionalize the teaching profession, which is likely to include an evaluation system to reward and support great teaching. Additionally, the State Board of Education will propose a series of steps that aim to turn around schools that underperform year after year. Our vision: Every high school graduate is ready for college and work. Every child deserves to choose his or her path after high school. Unfortunately, not all high school students are given this choice in Washington. Only 41 percent of high school graduates meet college entrance requirements — and over half of entering community college students take remedial classes they should have mastered in high school. To help ensure a high school diploma means college and work ready, the State Board of Education adopted CORE 24 as the new graduation requirement framework. CORE 24 aligns high school course work with college entrance requirements and workforce expectations. Before the Board can implement these new requirements, we need to persuade the Legislature to fund more than just a five-period day. The time for bold solutions is now. 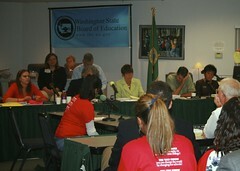 The reform efforts mentioned above will be debated and decided during the upcoming 2008-09 school year. In this year of education, it is appropriate to assess not only student achievement, but citizen involvement. What will our citizen report card show? Join us to change the world by changing our schools. We’re parents and community members who saw a need for a more independent voice and real results for all children. We’re dedicated to the idea that every one of our million school children deserves an excellent education and we need you. 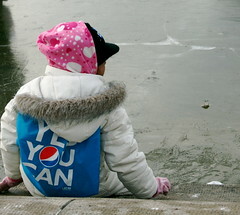 Visit didyouknowcampaign.com to learn more about what you can do to make a difference for kids. Hi, I’m Katarina. Born here in Seattle, I am an upcoming high school junior. I have attended private school my whole life but I’m very interested and eager to learn more about issues in the public schools. Through Rainier Scholars, I was offered this opportunity to intern at the League of Education Voters office. I consider Rainier Scholars more than just an academic program but as a family. The positive and continuous encouragement from everyone at RS has led me to truly believe an individual can make a difference in this world. By helping to develop future leaders, Rainier Scholars has helped me and my peers see our potential and have motivated us to step to up and prove that success is for everyone. I have been a part of Rainier Scholars since fifth grade and looking back, I can see the difference they have made in my life. In two years I will be off to college. At this point, I am still unsure about what school I want to attend or what profession I want to pursue but with the support of school counselors, family and Rainier Scholars, I know I am heading down the right path. As a child I wanted to be everything. Now that I am older I know I can be anything, I just have to believe in my dreams and know my options. I enjoy playing volleyball and just kicking back in the summer sun with friends. I spend a majority of my time with my two sisters and parents. Art is a large part of my life. I danced ballet for six years and I have recently started to draw and paint more. I played the piano and flute for a little and I listen to music whenever I can. I am also an active member of my church and youth group. Summer is my favorite season and I’m always up for an adventure.